Mel Gibson’s The Passion of the Christ is probably the biggest Hollywood story of the year. No studio would touch the project, so the star funded the 25 million dollar production himself. Passion tells the story of the last twelve hours of Christ’s life. It has received an 18+ rating as a result of the violence that Jesus suffers on screen. The film caused controversy for a number of reasons upon release. Firstly, many viewers had difficulty with the amount of graphic violence, even if they were familiar with descriptions in the gospels. Critics suggested that focusing on this aspect of the Jesus story does not do justice to the rest of the story. More vocal were the critics that accused the film of anti-Semitic imagery. Many argued that the Jewish characters in the film were damaging stereotypes, and that the film could lead to retaliatory violence against Jews. So despite this attention, or maybe because of it, the film was a HUGE blockbuster. It made over 300 million dollars in its domestic release. Church groups were solicited to support the film, and support it they did. Entire theaters were booked, as many groups used the film as an outreach tool. This past week, four million copies of the DVD sold on the first day. Many had been bought and paid for weeks in advance. So what’s all the fuss? Well, the movie is very gory. This writer thought that Scorsese squeezed every drop of blood out of the New Testament in Last Temptation of Christ. That is nothing compared to the blood in this film. Passion is a nearly surgical exploration of Jesus’ suffering when he is put to death. The filmmakers even exaggerate certain gospel descriptions, such as the sparse description of Christ’s flogging, to present the even-brutal-by-Roman-standards flogging seen here. 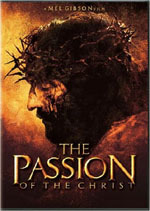 During Christ’s passion, the film flashes back to gospel events, and events created by Gibson and screen writer Ben Fitzgerald. Despite these flashback scenes, the violence takes center stage here. The viewer may be left scratching his head as to why. In fact, the attention paid to the violence comes at the expense of nearly every gospel detail that Gibson tries to squeeze into the film. After Christ’s death, there are several events squeezed together that seem a little rushed. Perhaps if we had a minute less flogging, which by the way is much more shocking than the crucifixion scene, the other business would not seem as rushed. One problem with the film is the inclusion of the Devil, or sin personified. The inclusion of this element injects the theological concept of Christ’s death being in retribution for the sins of man. For some reason this theme seems out of place with the more specific survey of Christ’s suffering in near real-time. A high-level theory like this requires a bit more distance from the granularity of detail seen here. The metaphorical and the extremely literal don’t seem to jive in this instance. Ultimately, the devil comes off as a little silly. He/she shows up with a mini-me devil at one point. It’s nice to see the singer from Bauhaus getting work. So despite having a little difficulty with the execution of the film and its concepts, this viewer must tip a hat to Gibson for the great performances he gets out of his actors and for how beautifully shot a film this is. The fine actors speak Aramaic and Latin, with subtitles translating the familiar dialog, which is an interesting spin toward verisimilitude. As for the cinematography, this is a great film in terms of shot composition. Just look at the shot of the Marys and John with the body of Christ, after he is removed from the cross. It is a work of art, and very reminiscent of a plaque on a church wall depicting the stations. A mention must be made about the accusations of anti-Semitism. This viewer expected to be hit over the head with such images, as was alleged during the film’s theatrical run. Instead, I am pleasantly surprised to see none of what these critics charge. Certainly corrupt Jews have Jesus arrested, but their more sensible peers scoff at the monkey trial and the lack of process. There are several sympathetic Jewish characters in this movie. The man who helps Jesus with his cross, and the lady who offers him a drink are not disciples, and somehow are not monsters. The Romans are the monsters here. The antagonistic Jews in no way represent all Jews in the movie; at least to this viewer. The transfer on the DVD is excellent. As mentioned earlier, the film is quite beautiful in places, as well as horrifying in others. Gibson and cinematographer Celeb Deschanel are artful throughout. Use of color and contrast are very interesting, and the 2.35:1, anamorphic transfer is beautiful. Both Dolby Digital and DTS 5.1 mixes are presented on the disc. The sound mix is active and rich, with music and sound effects filling the room. Thunder booms, and nature sounds are ever-present in the surrounds. As for that music, Peter Gabriel should check the locks on his studio. The score is, in places, VERY reminiscent of Gabriel’s score for Last Temptation. The percussive, world music-inspired score is at times quite similar to specific tracks from Gabriel’s album. Extras? Nope. Gibson is fleecing the DVD neophytes from the Churches. Y’see, the old Ladies didn’t run out and by Star Trek II on DVD, only to have to go buy a 2-disc set a year later. They haven’t learned. Stupid old ladies. Man will they be pissed when they have to pick up the Ultra Collector’s Edition next Christmas, or whenever. I wonder if it will come with a flask of holy water? So it looks good in places, it’s in your face, but it doesn’t add up. And if you dig it, wait for a collector’s edition.